The Illustris project took 5 years of software development and 3 months running on 8000 processors – but it sure was worth it – the result is truly monumental! Now, researchers finally have an accurate model of the development of the universe, which even though is rough around some edges, still blends in well with today’s accepted science, and even makes some valuable predictions. The vast majority of our Universe is made out of dark energy and dark matter – something which we can’t see directly. Everything we know about them, we infer from indirect observations. Testing this extraordinary scenario requires precise predictions for the formation of structure in the visible matter, the things we can see – stars, galaxies, black holes. Astrophysicists think of these visible elements as organized in a ‘Cosmic Web’ of sheets, filaments, and voids, embedded with the basic units of the cosmic structure: galaxies. 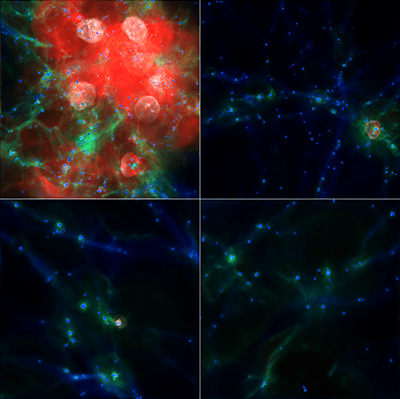 Basically, what Illustris set out to do was project a set of large-scale cosmological simulations, including galaxy formation – one of the more complex processes in the Universe. 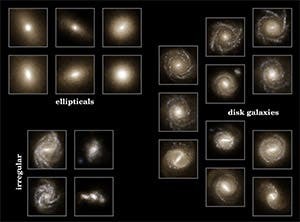 This was the best model of galaxy formation developed to date, taking into consideration the expansion of the universe, the gravitational pull of matter onto itself, the motion or “hydrodynamics” of cosmic gas, as well as the formation of stars and black holes. The model also takes into consideration the fact that many conditions changed since the early days of the Universe, and also adds that into the fray. 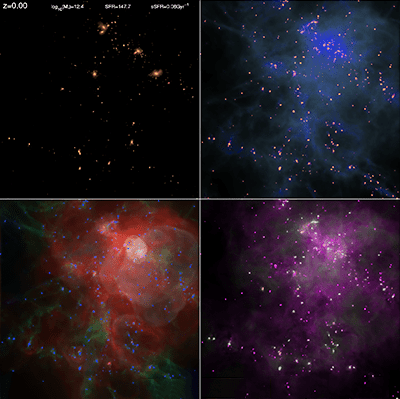 Their simulated volume contains tens of thousands of galaxies captured in high-detail, covering a broad range of masses, shapes, sizes and rates of star formation, and apply the properties observed in real life. 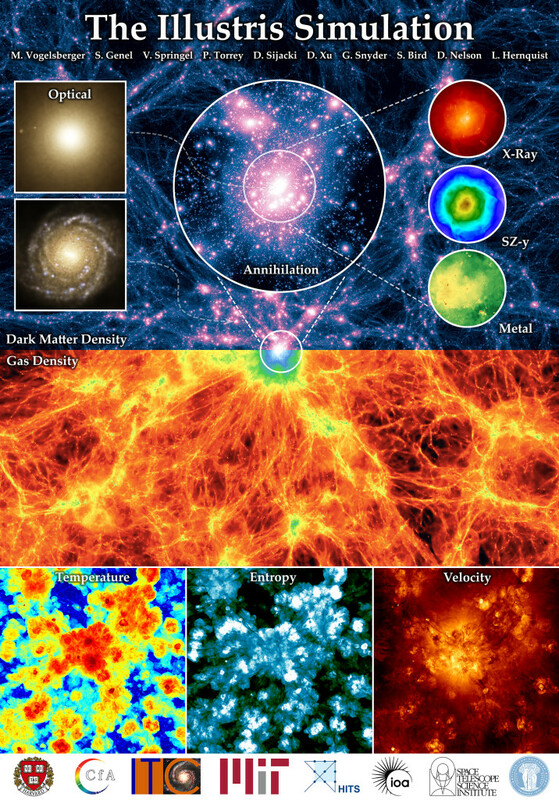 Illustris simulation overview poster. Shows the large scale dark matter and gas density fields in projection (top/bottom). The lower three panels show gas temperature, entropy, and velocity at the same scale. But this model isn’t only a projection of what we already know – it can help us learn new things as well. However, the main problem here, before we start making deductions based on this model, is ensuring that it is an actual reflection of reality – and with the immense complexity and numerical calculations involved, that’s a hard thing to do. Naturally, this leads to the need for some sort of simplification. For starters, some processes, such as the birth of individual stars, cannot be directly captured in a cosmological simulation. But even if you look at just the larger picture, everything has to fit in with the observed data – and while there are still some corrections to be made, in the grand scheme of things, Illustris fits things almost perfectly. It successfully reproduces a wide range of observable properties of galaxies and the relationships between these properties. A key element here is the so-called “specific star formation rate” – the rate of new stars being formed in a galaxy, divided by the amount of already-existing stars; it fits with the observed values not just for this period, but for all ages throughout the history of the Universe. It precisely measured the gas content of the universe, and where it resides. Furthermore, where data does not exist, the model can make predictions about the evolution of the gas. Outside of individual galaxies, Illustris also predicts that at the present time, the majority of gas (~81%) remains in the “intergalactic medium” (the space between galaxies), but that this gas contains only a minority (~34%) of the metals so-far produced in the universe. 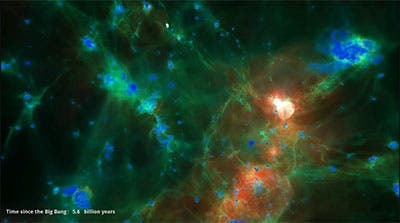 It investigated “satellite galaxies” and their connection to cosmological evolution. Satellite galaxies are galaxies which revolve around bigger galaxies, much like a planet revolves around its star. Illustris also studied the changes in internal structure as galaxy populations evolve in time, the impact of gas on the structure of dark matter, and it can even produce “mock observations”. 1 – Time evolution of a 10Mpc (comoving) region within Illustris from the start of the simulation to z=0. The movie transitions between the dark matter density field, gas temperature (blue: cold, green: warm: white: hot), and gas metallicity. 2 – Full simulation cube showing dark matter and gas temperature at the present day. The cube has a sidelength of about 100 Mpc. The video shows the full matter distribution by slowly adding slices on top of each other. 3 – Continuous zoom-in from the scale of the entire simulation volume (~100 Mpc) to the scale of an individual spiral galaxy (~10 kpc), highlighting the diversity of structure across spatial scale, the large dynamic range of the simulation (106 per dimension), and the relationship between dark matter, gas, and stars. 4 – Time evolution of a 10Mpc (comoving) cubic region within Illustris, rendered from outside. 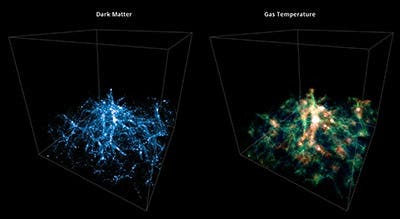 The movies shows on the left the dark matter density field, and on the right the gas temperature (blue: cold, green: warm: white: hot). The rapid temperature fluctuations around massive haloes are due to radiative AGN feedback that is most active during quasar phases. The larger ‘explosions’ are due to radio-mode feedback. 5- Time evolution of four separate sub-regions of the Illustris volume, from high redshift to z=0, showing gas temperature. Each region is several Mpc on a side, and each samples a different over-density relative to the cosmic mean, from highly over-dense (top left) to under-dense (counter-clockwise). 6 – Time evolution of four separate quantities from high redshift to z=0, in an over-dense region 7.5 Mpc on a side. 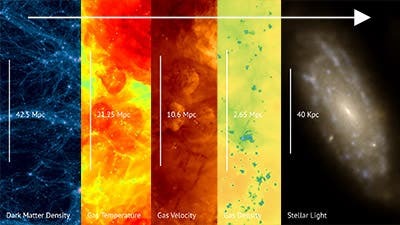 Panels show stellar light (top left), gas density (top right), gas temperature (bottom left), gas metallicity (bottom right). 7 – Time evolution from high redshift to z=0, demonstrating the formation of a massive elliptical ‘red-and-dead’ galaxy as a result of a multiple merger around z~1. Panels show stellar light (left) and gas density (right) in a region of 1 Mpc on a side.